She’s since dropped “the Beekeeper” for simplicity’s sake, but her upcoming third album, Even in the Tremor, promises to be as deeply emotional, personal, and complex as those early days of writing. 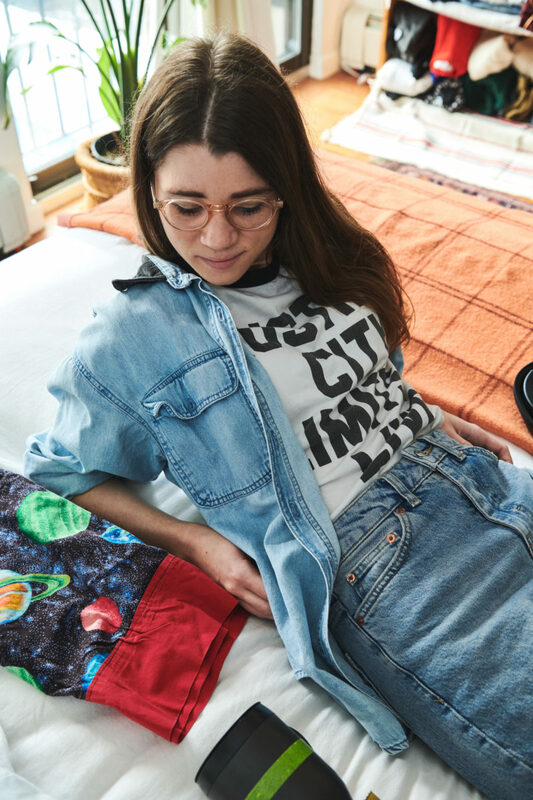 We caught up with Spaltro at her soon-to-be-vacant apartment on the border of Queens and Brooklyn. 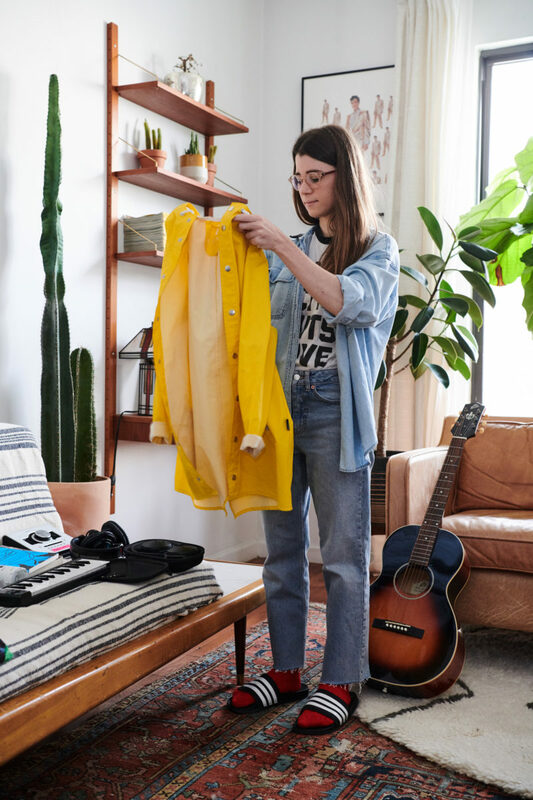 Here, she shares how she’s preparing for tour—which she, personally, is managing—and her favorite travel tips along the way, from how to stay creative to the best way to save money on coffee purchases. 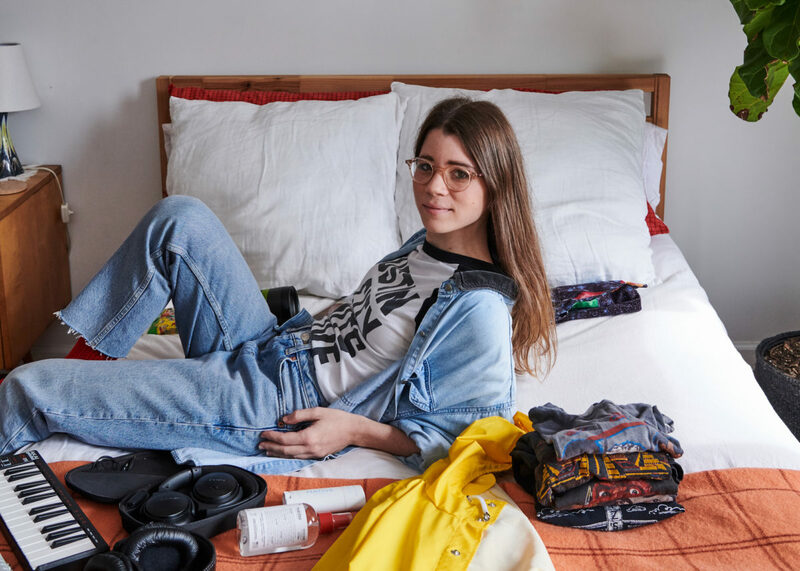 Ally Spaltro, AKA Lady Lamb, packing up in her apartment. 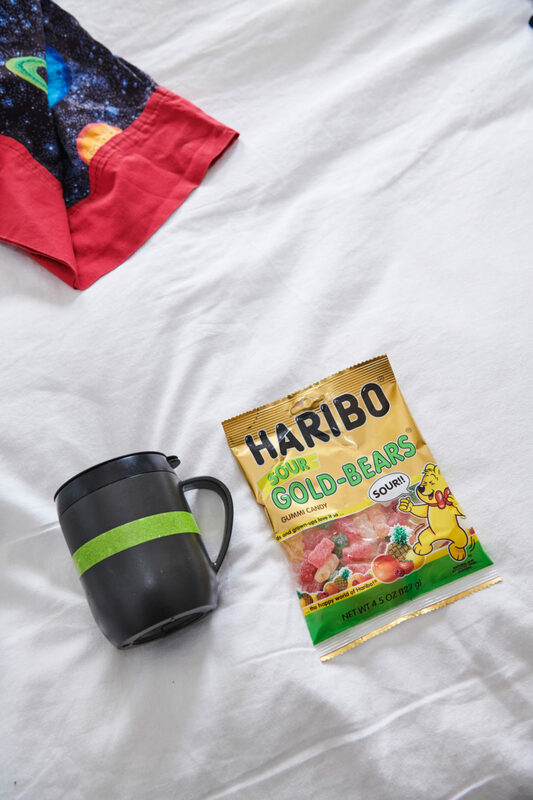 "I always have a candy stash—these sour gummy bears are new." "I always bring Rilke with me. 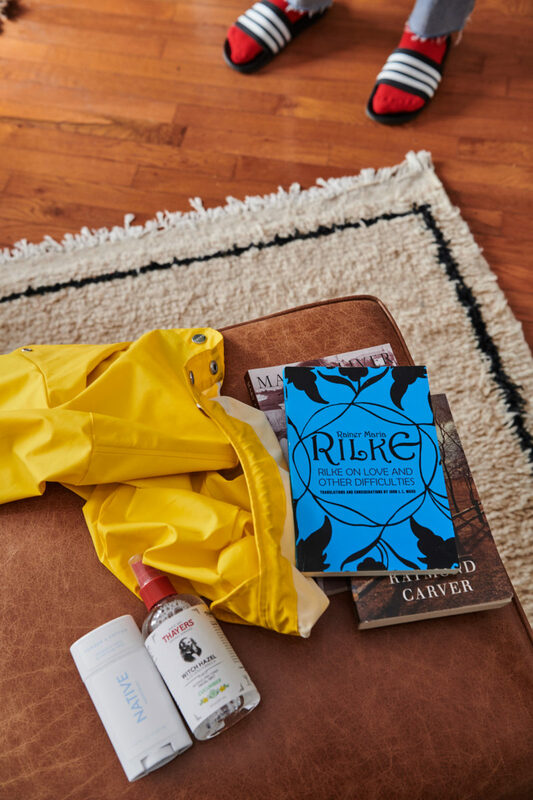 I will end up reading fiction on the road at some point, but I always like to bring poetry to get that flow of inspiration." How do you both star in and manage your own tour? It’s funny, I’ve always tour managed. It’s second nature. I think because I love to know exactly where we’re going. I do all the prep beforehand. I look at the map and see how far the distances are and figure out where we should stay, if we should stay in the city or outside the city that night. All that stuff. 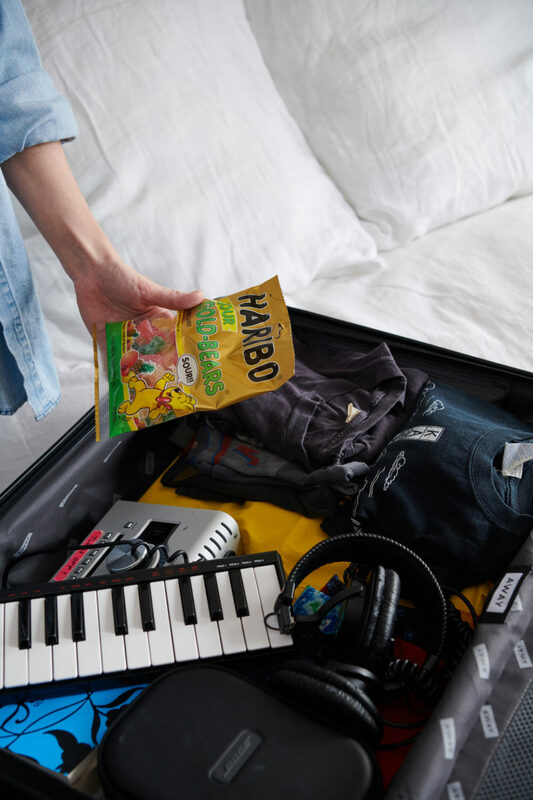 Are you the same way when you travel for fun? I like a mix of spontaneous and planned. I do like to have an idea of what there is to do and when I’m going to be doing it and how to get around. One of my favorite ways to travel is just to pick a state and rent a car and drive around the whole state. I’ll treat it like a tour, where I’ll actually do all this research on the state and the places to go and the right route to get there. It’s the best way to see America in my opinion. I’ve done it with two states so far: Nevada and Tennessee. What do you like about traveling that way? Just looking out the window, how the scenery changes. I want to do this with every state because I can now picture in my mind, visually, I understand those states so well. I have these memories of how everything is laid out, and what each town was like, and it’s like it’s deeper understanding. You don’t get that on tour though. You’re just in and out. "My little brother sewed this space pillow case, and you know what? You will never lose this in a hotel." A yellow Rains coat Spaltro picked up in Portugal. "A lot of times, especially on tour, I’ll be loading out and it’s raining. Why not wear your rain coat? It’s super packable, I just roll it up." Spaltro packs a travel french press (left), but not because she's a coffee snob. "I love bad coffee—like gas station coffee I'm all about it. But this saves a lot of money on the road. You could easily spend $90 a month on coffee. Let me spend $10 instead." Tell me more about your songwriting process. I usually start with lyrics. In fact, if I don’t really have lyrics, then I don’t know what I want to say, and then the music doesn’t really come. I have a song on this new record called “Deep Love,” and I wrote it in like 10 minutes because it was one of those special moments where I was sitting in my studio and I was just looking out the window and feeling kind of stuck, and I just started playing some chords and improvising lyrics and the whole song was written that way, not writing anything down. Improvising the words until I memorized them. And then the song was written. That sort of fluidity doesn’t happen all the time. 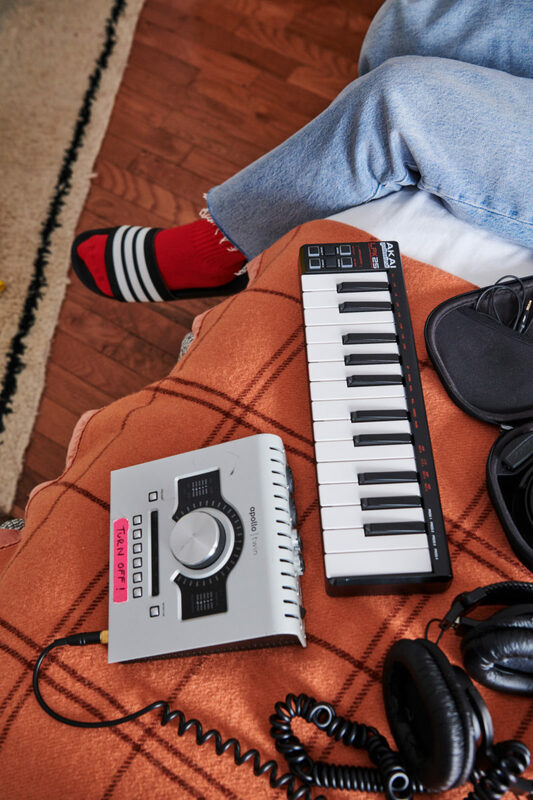 How do you write songs when you travel? I keep a notebook and I tend to be inspired when I’m moving, like when I’m in a car or even on the train is when I start writing lyrics. In fact a lot of what I write ends up coming out when I’m travelling more. It’s actually more common than when I’m just sitting at home. There’s something so present about traveling, which is why I love to travel; why I love to tour. You’re going from point A to B, and I find myself really conscious of things like safety or whether I’ve had enough fruits and vegetables. I love how traveling makes you more aware of your own well-being. Especially when I’m on tour, I’m really concerned with staying healthy, and I think that translates outside of self-care, into paying more attention to what I’m seeing, paying attention to people that I see out in the world in their normal lives. I’m so fascinated by that. On tour you kind of feel like you’re in this bubble that’s moving through time in an alternate universe because you’re passing through and you’re seeing where and how people live from the outside. Spaltro's compact writing rig she hooks up to her laptop. 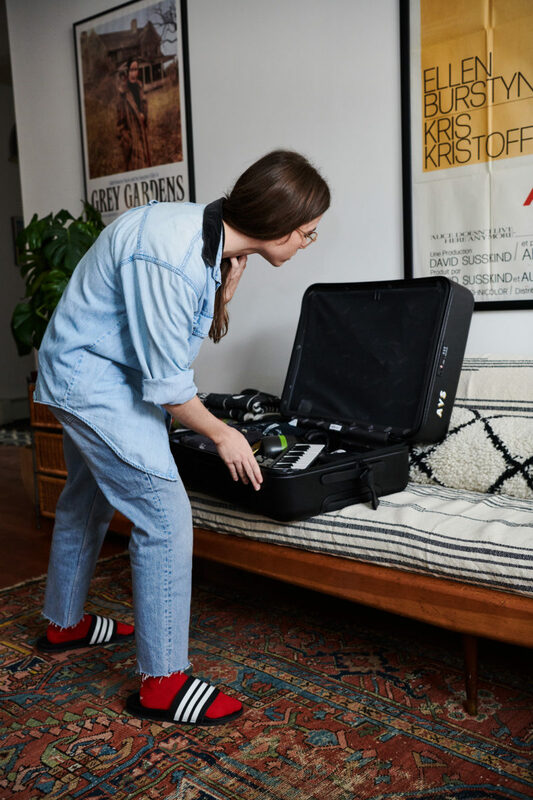 "I can literally write a whole record with this," she says. At one of her shows, a fan gifted Spaltro a Bruce Springstein shirt he got at a concert as a kid. "He knew I loved Springstein, and he told me he wanted me to have it. I really cherish it. It's one of five t-shirts that I literally bring on every single trip. They're ridiculous but they're so soft." 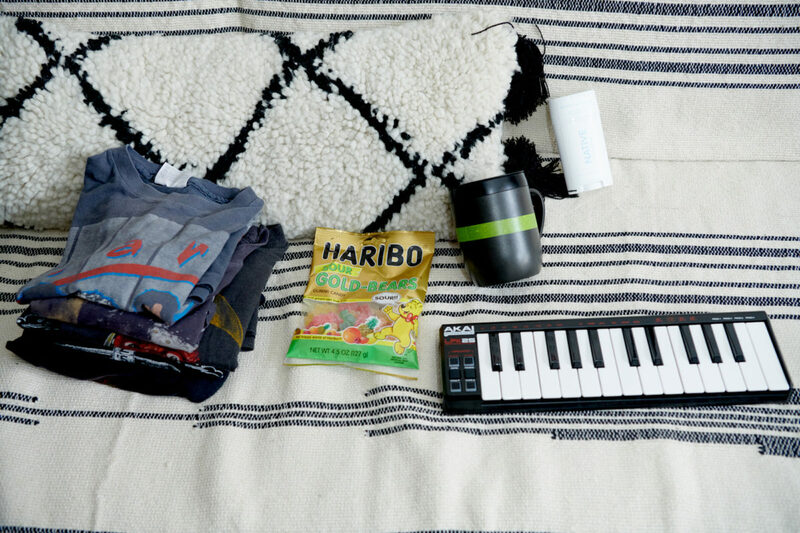 What do you bring with you to write and record music? I’ve been writing in my phone lately, but I don’t like that habit. I used to be a notebook carrier, so I think this time I’m going to bring a notebook. I have a couple that were given to me, but when I’m home I use the same dollar store notebook—I like writing with graph paper so that my lines stay straight. So much of my new record I wrote on the road with this mini keyboard recording rig. I did a lot of traveling when I wrote this album. I lived in Montreal. I went to Nicaragua for a while. I sublet my apartment and just chose places to live—and usually with cheaper rent than New York. I went Mexico and Europe and took that Nevada trip. I bring this rig with me when I know I want to try to write. 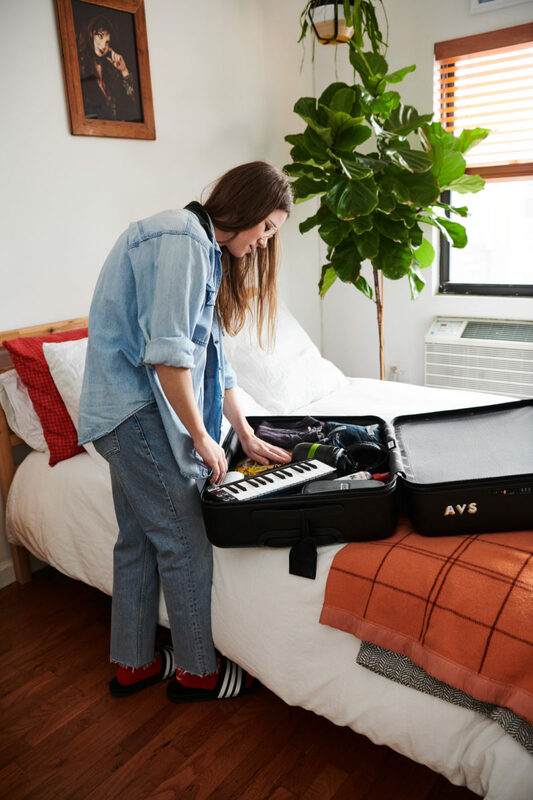 How do you stay grounded on tour? I bring things that are sentimental. Things that make me feel safe and comforted on the road and help me stay present. I have a few soft T-shirts that I always bring. It’s almost superstitious. I always bring this kind of ugly pillowcase that my little brother made in school when he was eight years old. I always I bring my own pillow with this pillow case. I bring these Adidas slips everywhere. I’m addicted to them. Have you ever worn them on stage? No! But the first thing I do in a hotel room is put these on. It’s all about building little tiny routines everywhere you go so you just feel secure. Sometimes you do feel anonymous when you travel or you feel homesick or you just feel a little vulnerable or out of your element, and the little things you can do to make it feel like there’s some continuity; you build a pattern everywhere you go.